Scavenger species are necessary to a thriving ecosystem. Without scavengers, carrion would lie on the ground and rot. Instead, a variety of creatures -- insects, reptiles, birds and mammals -- eat dead animals. Australia's scavengers live in the desert, the outback and the backyards of its cities and towns. Australia's largest insect scavenger species is the meat ant (Iridomyrmex purpureus). Meat ants, also known as gravel ants, are voracious foragers, searching during the cool hours of the morning and evening for dead insects and animals to carry back to the nest. They live underground in large colonies of 60,000 or more individuals. While meat ants are largely scavengers, they also attack and kill invasive cane toads. Cane toads depend on their poisonous skin to protect them from predators. Unaffected by the poison, meat ants swarm over the toad and kill it. Australia is home to several species of monitors, including the lace monitor (Varanus varius) and Gould's goanna (Varanus gouldii), also known as the sand monitor. These carnivorous lizards eat amphibians, birds, birds' eggs, insects, other reptiles and small mammals. Both species are known for scavenging for food near towns and cities and eating road kill and other carrion. Lace monitors live in trees, climbing to the ground to hunt for food, while Gould's goannas often appropriate rabbit burrows as their homes. All species of monitors are protected under Australian law. Australia is the home of several species of crows and ravens, including the Torresian crow (Corvus orru) and Australian raven (Corvus coronoides). Crows and ravens are omnivores, eating insects, small animals, fruit, seeds, garbage and road kill. Another aggressive scavenger hosted by Australia is the south polar skua (Stercorarius maccormicki). This wide-ranging sea bird nests in Antarctica, migrating in March to regions as far north as Alaska and Greenland. While in the southern and northern reaches of its range, its primary diet is fish and penguin eggs and chicks; it scavenges from garbage and steals food from other birds when it has the opportunity. 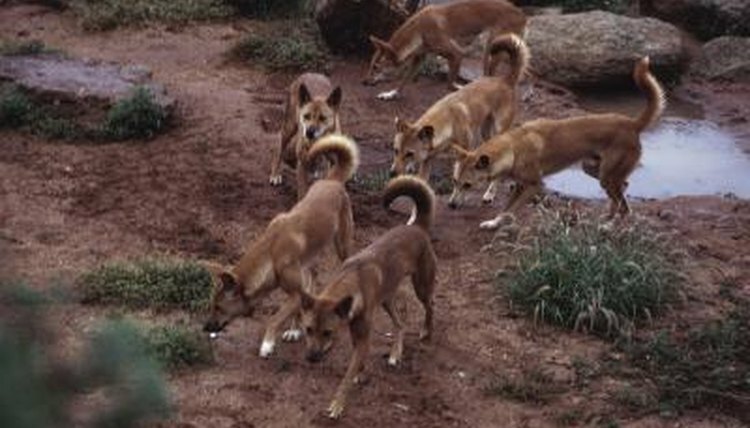 The dingo (Canis lupus dingo) is common throughout Australia, preying on small animals, birds, reptiles and rabbits. Like most dog species, the dingo is also a scavenger, eating garbage and carrion or road kill when it's available. Another carnivore, the spotted tail quoll (Dasyurus maculatus), a marsupial, preys on amphibians, birds, insects, mammals and reptiles. It will also eat carrion and road kill, scavenging for meat within its territory. It eats only meat.